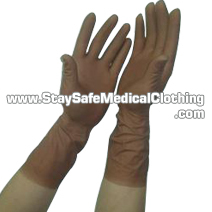 are disposable gloves which are used to cover a surgeon’s or physician’s hands during surgery. They are designed to reduce the risk of transferring pathogen’s and contaminants from the health care provider to the patient, while also protecting the health care provider from any contaminants from the patient. 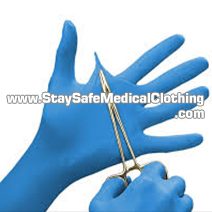 Surgical gloves are often made to a higher standard than examination gloves, as they provide a high level of protection, and so are used in any high risk situation. For this reason they can also be used by medical professionals who provide care to patients in isolation. Surgical gloves are often made to a more precise size, and with higher sensitivity, to allow for the most accurate handling of instruments. Latex Surgical Gloves for a long time have been the benchmark standard type of glove, as latex has been the first material to be used for surgical gloves. Although, they come with some issues mainly for people with latex allergies, they have also a lot of benefits as latex is an excellent material for surgical gloves. They come with an excellent fit, high tactile comfort, and also have high sensitivity, durability, and prove to be an excellent barrier protection. As well as this, they have a high puncture and chemical resistance, and can therefore be used in all high-risk situations such as when handling chemotherapy agents, or during surgery. Nitrile Surgical Gloves have become popular in recent years due to the excellent features they provide. These include: excellent tear resistance, chemical resistance against various chemicals, tactile sensitivity, barrier protection, and high durability. As well as this, they are suitable for people with latex allergies. Polyisoprene Surgical Gloves are made of polyisoprene which is a synthetic material which has properties very similar to latex. This material is considered a synthetic latex that has the advantage of being allergy-free, similar to Nitrile in this regard, but still more closely resembles the properties of latex which is why it is preferred by some medical professionals over Nitrile. Polyisoprene is the most expensive material for surgical glove production, but continues to be an increasingly popular option. 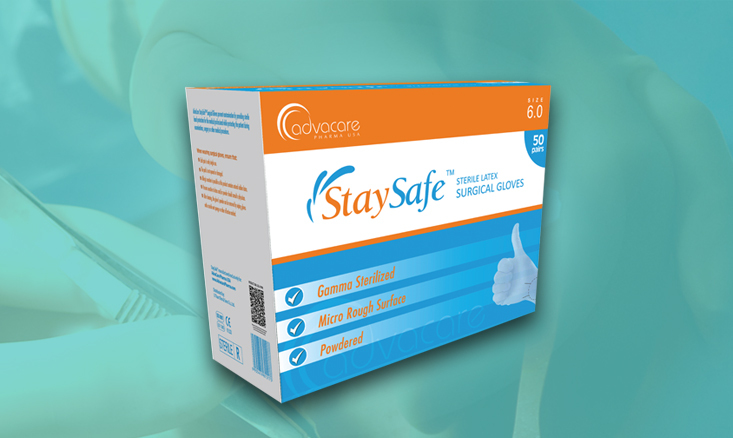 Why should I use StaySafe™ surgical gloves? StaySafe™ surgical gloves are made to ASTM standards, and even our standard gloves are thicker than normal to provide a higher level of protection. As well as this, they can be made in different sizes, sterile or non-sterile, powdered or non-powdered, to suit all different needs and preferences. Powdered gloves often have cornstarch or calcium carbonate added to them, in order to lubricate the inside, so it is easier to get ones hand in, and to avoid the glove sticking to the hand. Powder free on the other hand do not provide lubrication, and so are harder to take off, however they are suitable for people who are sensitive to the powder, as the powder-free version will not cause a rash. 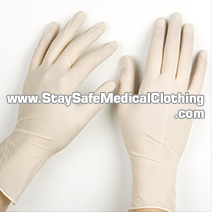 Sterile gloves are sterilized according to FDA standards, and have a one in one million chance of being non-sterile. They typically are also made to a higher acceptable quality level, and so there is a much less chance of finding pinholes in them. Are surgical gloves only for surgeons? 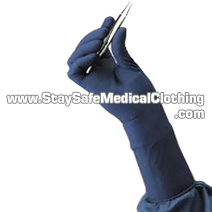 Surgical gloves are designed to be used by medical professionals when in a high risk situation, including within surgery. There are other types of gloves better suited to lower risk situations. The main difference is that surgical gloves are made to a better standard, and they are used in high contamination risk environments, and so are made to be thicker and more resistant. Can latex surgical gloves cause allergies? Latex contains various components, such as certain proteins, which can cause allergies, and so people with a higher sensitivity to those components experience the symptoms. Are nitrile gloves made with any latex or latex proteins? Nitrile surgical gloves are not made with any latex, and so they contain no latex proteins. This makes them suitable for people with latex allergies, who also need to work in high contamination risk situations. Are latex gloves better than nitrile gloves? This depends on individual needs. Nitrile provides much higher puncture resistance than latex, and is also more resistant to various harsh chemicals, however they are more expensive than the latex variety. Do you have more questions about our Surgical Gloves? Contact Us!